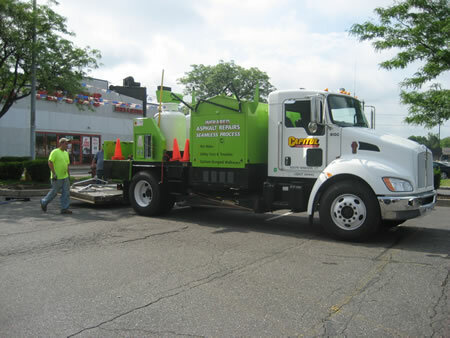 Capitol Sweeping Services, Inc. has joined the "green" movement in our own unique way: Infrared Asphalt Repairs. With rising oil prices and the demand for oil only getting greater, this new techique in asphalt repair uses less new asphalt, thus less oil product." 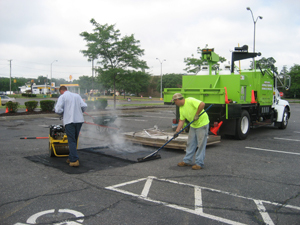 Infrared Asphalt Repairs recycles the damaged asphalt already in a parking lot and only adds a small amount of new asphalt." 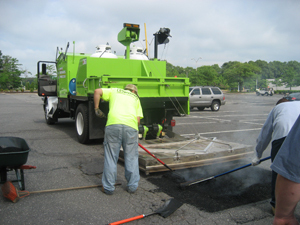 Unlike cut and patch, Infrared Ashpalt repairs creates a permanent, high quality pot hole repair. No water can seep through and no seams or points of weakness will come through later on. Infrared Aphalt Repairs can be done YEAR ROUND with only slight adjustments for the temperature. This new technology allows for us to heat asphalt in the reclaimer of the truck, so Capitol Sweeping Services, Inc. will have hot asphalt in the winter months! Infrared Asphalt Repairs can fix pot holes, trenches, man hole covers, and many other types of damage.